It’s a Gincredible cocktail teapot! Gincludes a filter basket for fantastic fruit infusions! Perfect for ginthusiasts and tea-totalers alike! It’s time to make tea time a little more… ginteresting! Leave civili-tea to the un-gin-spired and get naugh-tea with this G&Tea gift set! (Is that a gindecent proposal? Naaaaaa!). This is the kind of tea set your mum warned you about… which is why we love it so much! It includes a glass teapot with a rainbow tint and 2 matching teacups with gold trim. But, the gold decal on the teapot reads, ‘G&Tea’, letting you know that there’s a little more than a cuppa brewing! Soak teatime in ginfamy by mixing your gin and tonic right in the pot, then pouring it out into the teacups all classy like. 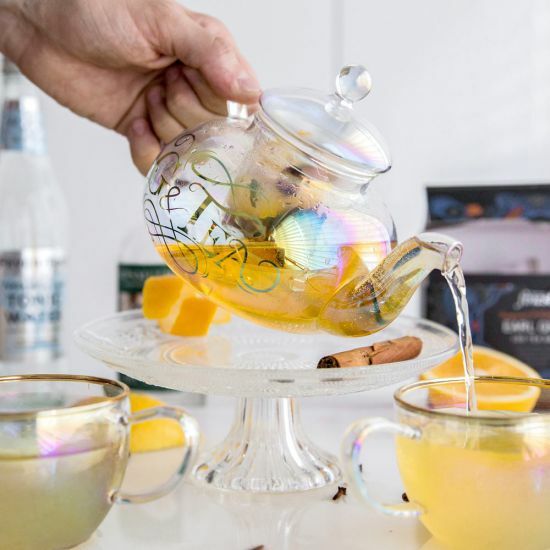 This teapot even includes a filter basket that you can fill with fruit (or anything that takes your fancy, really), to create tea-riffic ginfusions! If you’re more of a saint than a ginner, you can still enjoy this tea set by using it as… a tea set! It’s heat resistant, so you can actually use to make hot tea. And, if you’re not a tea-totaler but gin’s not your taste, this set won’t go to waste. You can create fruit-infused cocktails with other spirits. Use your ginitiative! If a nice little G&T is your special-tea, you can’t miss out on this gincredible G&Tea teapot and cups! Order yours this ginstant… pret-tea please!